Thaxton Cheyne was 5 years old and riding in the back seat of a car driven by one of his grandfathers, Charlie Rogers – Poppa Charlie, as Thaxton calls him – when the youngster had an important proclamation. “Poppa, you know I’m going to be a right-handed Bubba Watson, right?” the tiny voice said. Rogers was amused and curious. He asked Thaxton what, exactly, he meant. “It means I’m going to Georgia and I’m going to win the Masters,” Thaxton said. 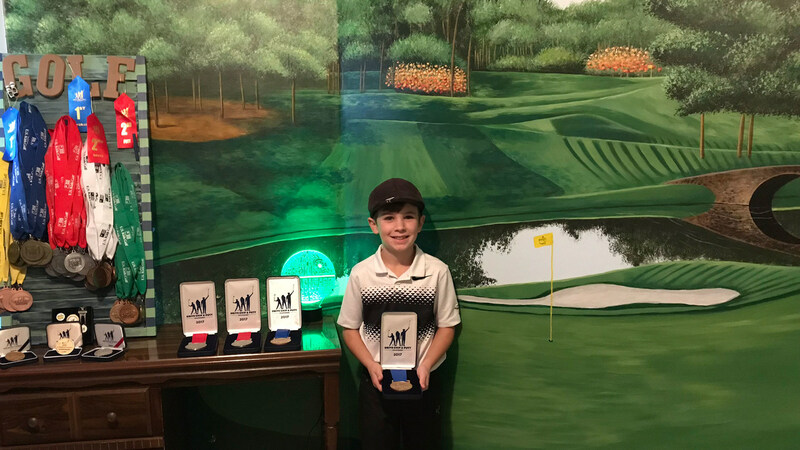 Thaxton is 9, a third-grader at Knox Elementary School in Canton, Ga., just north of Atlanta and a three-hour drive from Augusta National, give or take one Waffle House stop. At midday on Saturday, he rapidly banged out a few drives on the practice tee at the River Club, just across the South Carolina state line. Come Sunday morning, Thaxton and 79 others will be competing in the fifth Drive, Chip and Putt National Finals at Augusta National Golf Club. For the record, that means all 4 feet, 3 inches and 60 pounds of him. Thaxton Cheyne is a little pistol, smart as a whip, unfailingly polite, his bright blue eyes peering out attentively from beneath his old-school, Ben Hogan-style cap. Maybe he was born to be here. His dad, Garrick, and his mom, Crystal, thought it would be neat to have a nature-themed mural painted in their child’s nursery. Their sister-in-law, Karen Saldivia, an artist, jumped in to provide it. 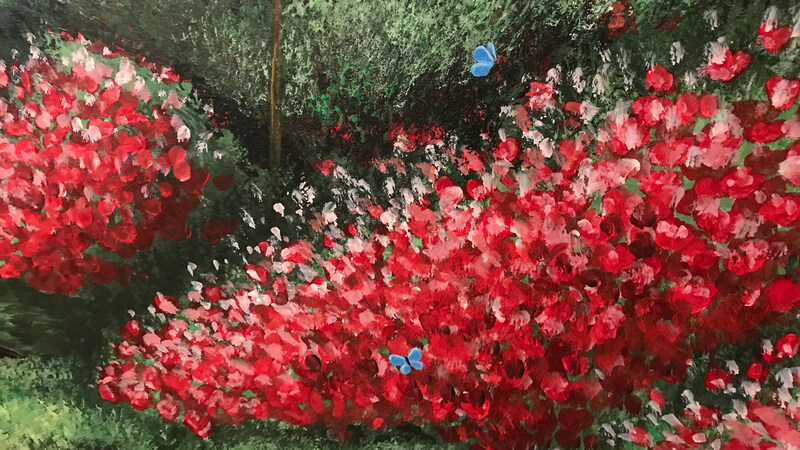 She had painted golf courses before, so her gift was an expansive mural of the storied 12th hole at Augusta National. 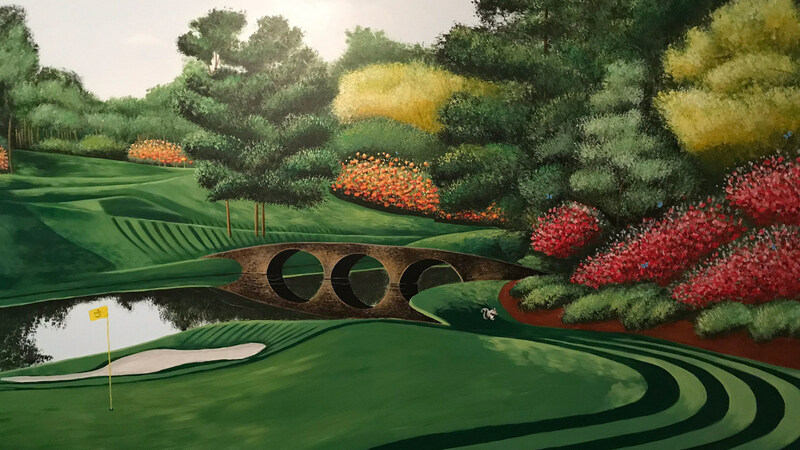 Drive, Chip, and Putt participant Thaxton Cheyne's room has a mural of Augusta National's 12th hole by artist Karen Saldivia. “Thaxton’s bed faces it – that’s the first thing he sees every morning,” Crystal said. Garrick Cheyne is a high school music teacher who, like his own father, who had the same occupation, enjoys playing golf in the summer. There are high ceilings in the basement of the family home, so Garrick figured it might be a good space to erect a net into which he could hit golf balls. Up it went. After Thaxton was born, though, Garrick didn’t hit balls for more than a year. But as he grew, his father had an idea: He could go downstairs and hit shots as Thaxton played with his toys. Yet Thaxton, at 18 months, had no interest in his toys. He wanted to do what Daddy was doing, and kept toddling over. When Garrick bought plastic clubs for him, Thaxton had no interest in those, either. “Real clubs, Daddy,” he said. So Garrick went down the road to a PGA Tour Superstore, bought the smallest 7-iron he could find, cut it down, put a tiny grip on it, and once home, handed the club to Thaxton, who proceeded to hit balls for two hours. He’s pretty much been hitting them ever since. Thaxton competes on the U.S. Kids’ Atlanta Tour, which has roughly 15 to 20 players ages 10 and under capable of shooting even par or better from the forward tees, Garrick says. Thaxton will compete in the Boys 7-9 division in the Drive, Chip and Putt. His best pal and frequent practice partner, Patmon Malcom, is competing in the Boys 10-11 division, as is another friend from the tour, Sahish Reddy. One reason that Thaxton loves this game? “I make a lot of good friends,” he said. Parents Crystal and Garrick Cheyne stand with DCP participant Thaxton Cheyne along with grandparents Barbara and Charlie Rogers, left, and grandmother Angelyn Hayes, right, as competitors practice for the 2018 Drive, Chip and Putt Natonal Finals. He shot 81-78 (from a 4,600-yard set of tees) in windy conditions at a tournament at Jekyll Island, Ga., recently, and has a low round of 71 at his home course, Bridgemill Athletic Club. On a warm day with the right conditions, Thaxton can pump his driver 165 yards. He hits open-faced flop shots that would make Phil Mickelson blush. For a 9-year-old, Thaxton is very analytical. He and Patmon have watched the replay of last year’s Natioanl Finals to figure out the angles of the chips they’ll face and the speed of the putts. Thaxton has been doing his putting of late at Pine Tree, a nearby course where the greens run 13 on the Stimpmeter. Because many competitors spend most of their time driving and putting, Thaxton has worked hard to make chipping his strength. He picked out his Hogan-esque cap at a store when he was 3, and wears it as a tribute to both Hogan and Payne Stewart, whose biography he has read. His favorite Tour pro is Jordan Spieth, but he lists Spieth’s caddie, Michael Greller, as his favorite player. “It’s amazing how he keeps Jordan so calm,” said Thaxton, who, given his age and the setting, is remarkably calm himself.